16/05/2006 - Dermi v1.6 is available. 15/11/2005 - Dermi v1.5 is available. 22/06/2005 - Dermi v1.4 is available. 07/02/2005 - Dermi v1.2 final release unleashed! 11/08/2004 - Dermi v1.2Alpha 2 released. This is a bugfix release. 11/08/2004 - Added News section. Dermi (Decentralized Event Remote Method Invocation) is a peer-to-peer (P2P), decentralized event-based object middleware framework built on top of a structured Distributed Hash Table (FreePastry) based overlay network. Based on an event-notification service that is the principal building block (Scribe), Dermi makes three innovative contributions: P2P call abstractions, a distributed interception mechanism, and a decentralized object-location service. Peer-to-peer call abstractions include one-to-one calls, and one-to-many calls, which can be either synchronous or asynchronous in nature. One-to-one calls do not use the event service, which fits more effectively in one-to-many calls. This kind of calls involve only two entities: an object client (stub) that sends a message directly to an object server (skeleton). One-to-many calls, use the application-level multicast layer to send notifications. There exist several kinds of one-to-many calls. Multicall is a remote invocation from one client to many servers (or viceversa). As client/server numbers increase, this approach scales better than having point-to-point connections to any interested client. Anycall is a new form of remote procedure call that benefits from network locality. We take advantage of Scribe's efficient anycast primitive to create a call to the objects that belong to the same multicast group (object replicas that can provide us with a service, for example). The anycall client is insensitive to which group object provides data; it only wants its request to be served. Manycall is a variation of the anycall abstraction. It sends a manycast message to several group members, continuing to route until it finds enough members to satisfy a global condition. Distributed interception lets us apply connection-oriented programming concepts in a distributed setting. With this service we can reconnect and locate type-compatible interceptors at runtime in a distributed application. We extended Scribe's classes to natively support this feature. Decentralized object location. We use the P2P overlay network substrate DHT facilities to build our object location service. It stores object-location information that can be used to find objects via human-readable names. Dermi is the decentralized version of ERMI, and it benefits from the advantages of the structured P2P network it is built on top of to provide many additional services, like the already commented anycall and manycall abstractions, efficient direct P2P calls, and a native distributed interception facility. 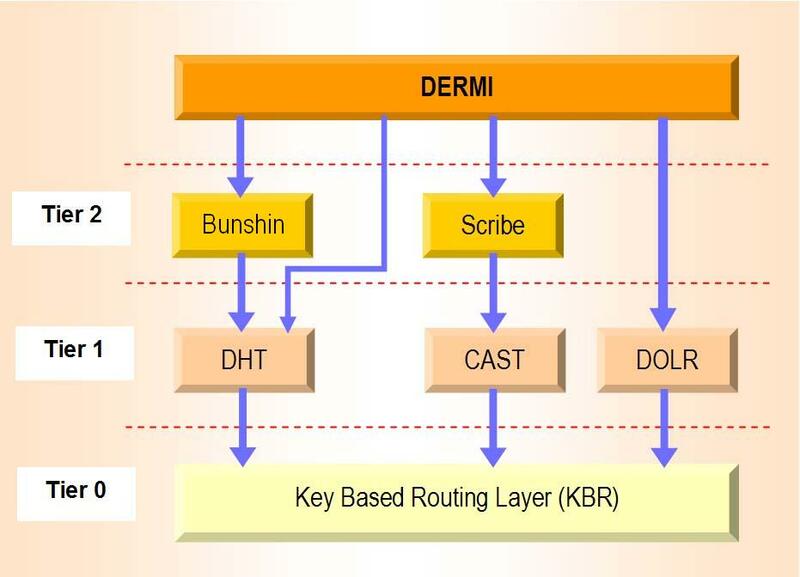 Dermi is built on top of a decentralized key-based routing (KBR) P2P overlay network. It benefits from the underlying services provided by the P2P layer, including group multicast and anycast (CAST), the DHT abstraction, and a decentralized object location and routing layer (DOLR). Moreover, Dermi uses the Bunshin object replication and caching system. Our system models method calls as events and subscriptions using the API provided by the CAST abstraction (which models a wide-area event service). A diagram can be seen just below. Decentralized Event Remote Method Invocation (Dermi). Release Notes: Migration to Bunshin 2.2.4 and FreePastry 1.4.4. More bug fixes. Release Notes: Migration to Bunshin 2.1.2 and FreePastry 1.4.2.
p2pCM is added to the distribution. More bug fixes, and more samples added. This version requires Java 1.5 runtime for execution and compilation. Dermic tool has been eliminated, and stubs and skeletons do not need to be generated in compilation time. Instead, the Dynamic Proxy technique borrowed from Java 1.4 onwards is applied so as remote object calls are intercepted in runtime by a dynamic proxy and sent towards the network to the destination object. Calls are then intercepted by a generic skeleton. Java 1.5 annotation mechanism is used to mark each remote procedure call with the desired invocation type tag (Multicall, Directcall, Anycall, ...). Moreover, an adaptation layer has been introduced, which provides Dermi's isolation from the underlying DHT technology used. This means that the transition from one DHT to another becomes an easy and transparent process for applications built on top of Dermi. Release Notes: This release includes major refactoring of Dermi code, major bug fixing, migration to FreePastry 1.3.2, thus including the utilization of Scribe via the Common API. Extensive tests and retransmission of lost events are included. Release Notes: Initial version of Dermi, based on FreePastry 1.3. Includes all the features described in the ICDCS 2004 paper: P2P call abstractions (including anycall and manycall), distributed interception, and a sketch of the decentralized object location service. CoopWork is an Eclipse cooperative development plug-in, which has been developed using Dermi. It benefits from Dermi's services, thus providing a set of collaborative tools, including presence services, a chat system, a list of currently modified resources, a log of published versions in the group, and a notification system. Additionally it provides code sharing tools. Distribution: Source and binary code, written and compiled in Java v1.4.1. RubÃ©n MondÃ©jar Andreu, M. Sc. Computer Science Student in the Department of Computer Science and Mathematics at Universitat Rovira i Virgili in Tarragona, Catalonia, Spain. Pairot, C., GarcÃ­a, P., Rallo, R., Blat, J., GÃ³mez Skarmeta, A.F. The Planet Project: Collaborative Educational Content Repositories on Structured Peer-to-Peer Grids. Accepted for publication on Proceedings of the 5th ACM/IEEE International Symposium on Cluster Computing and the Grid (CCGrid 2005). Second International Workshop on Collaborative and Learning Applications of Grid Technology and Grid Education (CLAG + Grid.edu 2005). Cardiff, United Kingdom, May 2005. Pairot, C., GarcÃ­a, P., GÃ³mez Skarmeta, A.F., MondÃ©jar, R. Towards New Load-balancing Schemes for Structured Peer-to-Peer Grids. Future Generation Computer Systems - The International Journal of Grid Computing: Theory, Methods and Applications. Vol. 21, January 2005, pp. 125-133. ISSN: 0167-739X. Pairot, C., GarcÃ­a, P., MondÃ©jar, R., GÃ³mez Skarmeta, A.F. Towards a Peer-to-Peer Object Middleware for Wide-Area Collaborative Application Development. Revista Iberoamericana de Inteligencia Artificial. Vol. 8, No. 24, Winter 2004, pp. 55-65. ISSN: 1137-3601. Pairot, C., GarcÃ­a, P., GÃ³mez Skarmeta, A.F., and MondÃ©jar, R., Achieving Load Balancing in Structured Peer-to-Peer Grids. Lecture Notes in Computer Science (LNCS) Volume 3038. 4th International Conference on Computational Science (ICCS 2004). 1st International Workshop on Active and Programmable Grid Architectures and Components (APGAC 2004). KrakÃ³w, Poland. June 2004, pp. 98-105. Pairot C., GarcÃ­a P., GÃ³mez Skarmeta, A.F. Dermi: A Distributed Hash Table-based Middleware Framework. IEEE Internet Computing. Vol. 8, No. 3, May/June 2004, pp. 74 - 84. Pairot, C., GarcÃ­a, P., GÃ³mez Skarmeta, A.F. DERMI: A Decentralized Peer-to-Peer Event-Based Object Middleware. Proceedings of the 24th IEEE International Conference on Distributed Computing Systems (ICDCS 2004). Tokyo, Japan. March 2004, pp. 236 - 243. Pairot, C., GarcÃ­a P., GÃ³mez Skarmeta, A.F., Rallo, R., MondÃ©jar, R. DERMI: Middleware para aplicaciones de trabajo en grupo descentralizadas. Jornadas TÃ©cnicas RedIRIS 2003, Palma de Mallorca, Spain, November 2003.